When the workshops are over, and the sun starts going down, there is still more fun at the NSSLF. Workshops and demonstrations on Saturday and Sunday, July 29th and 30th, 2017. Gates open at 9 am. Check out the 2017 Workshop Schedule. In addition to the workshops, don’t miss the entertainment, displays, demonstrations, and other exciting events. 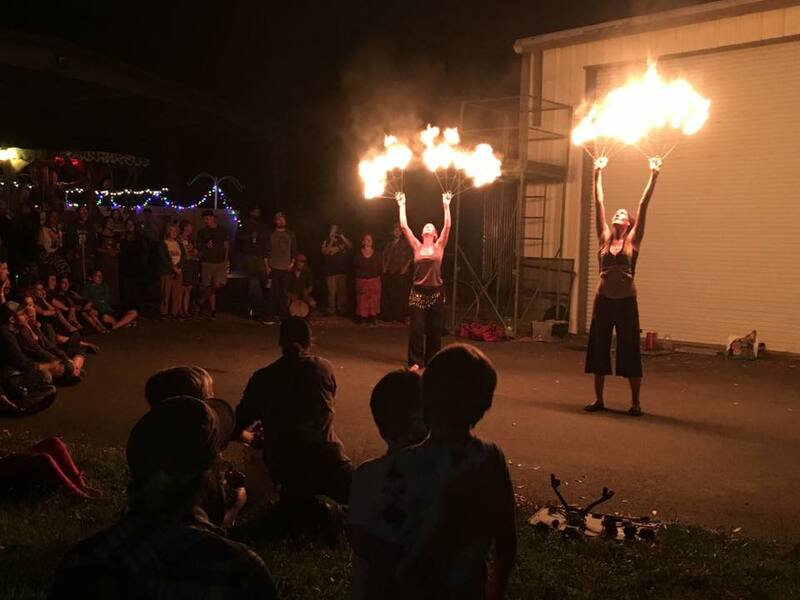 Bring your tall tales and top hats, tubas, hula hoops, feathers, & illusions. Your glockenspiels, talking llamas, & epic ballads, twinkle toes & moon howls. $5 or included with weekend pass. Sign up with Cap’n Rainbow if you want to get on the performance schedule @ 707-895-3807. 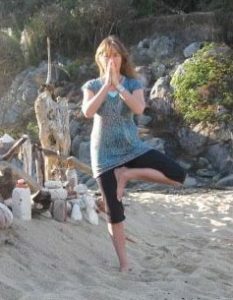 Mary Paffard is offering free Yoga classes in the SoBo studio across the street from the fairgrounds. Enjoy the community potluck and some great music and dancing with DGIIN under the stars and redwood trees! The music begins at 8 pm after the potluck dinner. This year we will be giving pins to fair-goers and members of their party when they drop off their potluck item. Potluck pins will need to be shown in the food line. This is to ensure that all potluck participants are able to appreciate the bounty of delicious, homemade food. If you would like to participate in the Saturday Local Food Potluck, please bring enough salad, side dish, dessert or drinks to serve 6-8 people, and your own place settings. 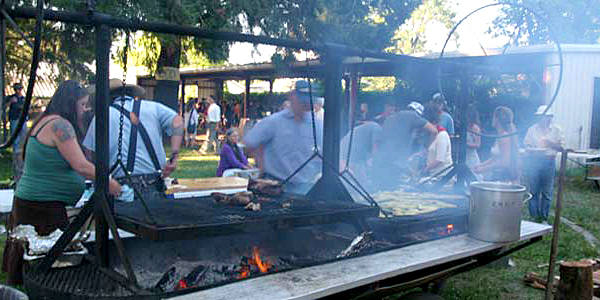 The Not So Simple Living Fair will supply BBQ, rice and beans. Bringing something grown in your garden or purchased from the Farmers Market is encouraged, but not essential. Potluck dishes can be left in June Hall during the day. We will supply some coolers, but it would be helpful if you can bring your own. There is no place to cook or reheat food. Download a PDF of a sample potluck label for your dish here. Please fill out both sides. It hangs over a cord above the potluck dish line. Put your name on your serving dish and cooler to help find it after dinner. Our volunteers will put out and clear the dishes. After dinner you can find them on tables along the back side of June Hall. 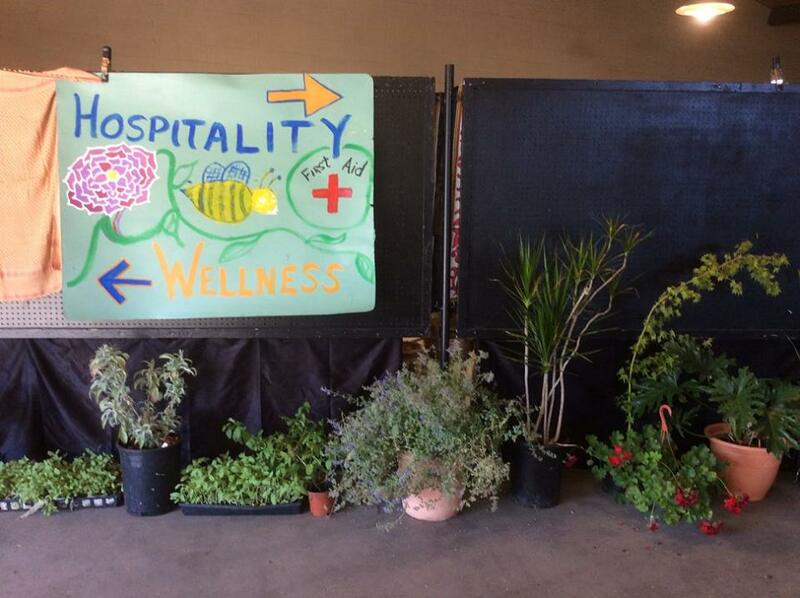 At the Not-So-Simple Living Fair, one of our goals is to generate a minimal amount of trash. Over the last three years, we have ended up with less than 2 bags of trash at the end of the weekend each year. We do this by asking everyone to BYO (bring your own dishes.) We also have a BYO vendor if you find yourself at the event without your own dishes. We will have a dish-washing station. We also compost all paper products along with all food waste. You will find stations with three cans – compost, recycle and trash. Please make sure you deposit your refuse properly. The music begins at 8 pm after the potluck dinner with DGIIN. Twice voted “Best Band” by the North Bay Bohemian, DGIIN is a six piece high energy dance band playing original songs and international covers. 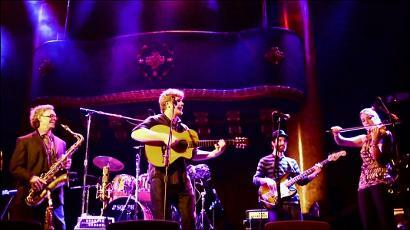 DGIIN’s style is a mix of Flamenco, Latin, French Cafe, Reggae, and Funk. Their passionate music and superb musicianship is guaranteed to have everyone on the dance floor. Find out more about DGIIN on their website. 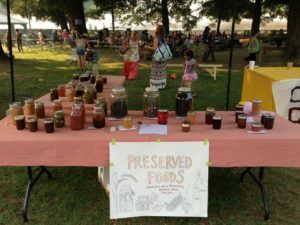 Local Food Potluck and BBQ on Saturday evening July 30th that has to be one of the largest and greatest of its kind anywhere! The AV Foodshed Apple Press will be at the Not-So-Simple Living Fair this year for fairgoers to press their own apples into juice. Tim Bates will donate apples to make fresh cider for the Community Potluck on Saturday night. The press will also be available for the use of those who would like to press their own apples. You can take your juice home or donate all or part of it to the Potluck. If you are bringing apples, please also bring containers for the juice. Check out the On-Going Demonstrations section in the schedule for a more comprehensive list. And be sure to take the time to visit our many vendors in the Marketplace. Here’s the list of vendors this year. The Wellness Center, located in June Hall, is a safe space dedicated to dealing with body issues, from simple First Aid — an EMT and herbalist see always available — and more, including looking at body issues and the diverse ways people deal with them. We’ll have open discussions expressing alternative perspectives and ways of healing and caring for one’s body. These are not classes or lectures but times when individuals can offer their ideas and experiences regarding health issues. Look for spontaneous notices to be listed on the Wellness Center’s outside board regarding topics being discussed. bring your own clearly labeled examples of food you have preserved yourself for others to admire and learn from. 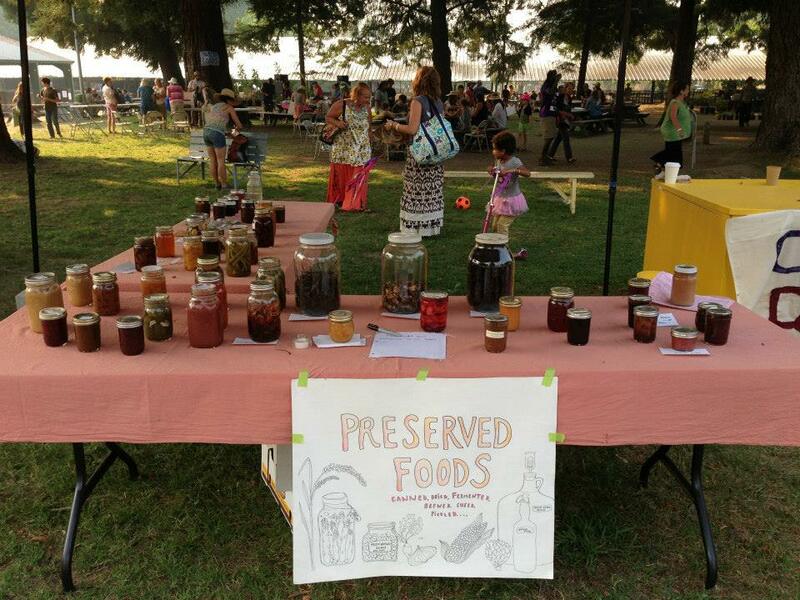 All examples should be labeled with the kind of food, preservation method used, and the name of the preservationist. They can be dropped off anytime Friday or Saturday, and should be picked up on Sunday afternoon. 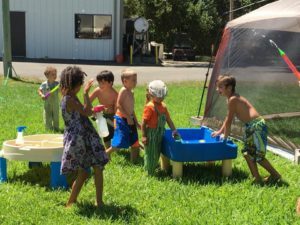 We have a great area for kids to learn and play. There will be a schedule of activities posted at the Kids’ Zone in Area 1. Fire making, animal care classes, felting, making hydrosol spritzers, bee games and information, playdough making, water play, herbal fun for kids, games, crafts of all sorts, and much more. Ukiah Poet Laureate (2014 – 2016), Bill Churchill, will do poetry workshops in English and Spanish. Keep checking our schedule. A tipi and book lodge are new additions to the kids’ area this year. Children under 10 must have an adult or older sibling with them at all times, when in the kids’ area. Come and share your bounty! Experience the skills of the moneyless economy. Bring items such as: tools, food, vegetables, fruit, preserves, pickles, herbal remedies, crafts, clothing, jewelry, hand-made items, books and more. We will gather in the Grove under the trees Saturday 5:00 to 6:00pm. Hope to see you there with your treasures. If you have any questions please contact info@notsosimple.info. This year at the Not-So-Simple Living Fair we welcome back Alicia with her delicious tacos and fresh salsas. A local favorite! We also welcome back Snowie with specialty snow cones! They will also be offering organic hot dogs, root beer floats and orange creamsicles, yum! 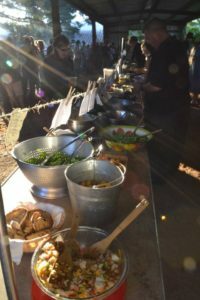 Representing the Boonville strip, the Anderson Valley Foodshed will be offering food from Boontberry, Mosswood and The Boonville General Store. Enjoy locally made pizza by the slice, wraps, salads, empanadas, cookies and brownies. Gluten Free and Vegan options available. $5 kid’s plate – one pancake, one slice bacon, scrambled eggs, orange juice or milk. $8 Mom’s plate – two pancakes, two slices bacon, scrambled eggs, juice or coffee. $10 The Farm – three pancakes, three slices bacon, scrambled eggs, juice or coffee. Pancakes include all the toppings, maple syrup, jam, sliced bananas, shredded coconut, chopped pecans, chocolate bits. Shele Jessee – Hollow Bone – traditionally tanned sheep hides, jewelry and indigo dyed textiles.